From leafy Worsley through to the terraced streets of central Salford, including a wide range of industry, Salford is as diverse as the people who live and work here. It’s a proud fact that Salford has one of the most diverse cultures of any city across Britain and we should be grateful that so many people choose to live and work here. Corner to corner Salford is barely 40 square miles and inevitably, when people from completely different backgrounds are living and working in close quarters, the social differences that exist can cause problems. What is viewed as acceptable behaviour to some people is seen differently by others. It’s good news that all crime has fallen across Salford in recent years and continues to fall. We have one of the largest police forces in the country to thank for this and, in particular, our Salford Neighbourhood Policing Teams have proven to be a particular success. By getting to know their areas and communities, the Police alongside PCSOs have made a real difference to the people of Salford. People like Sergeant Stuart McGuire and PC Jo Turner, PCSOs Mobasshar “Bash” Mazhar, Richard Newman and Jazmin Bryan are true local heroes who, in between catching criminals and helping those affected by crime, keep residents updated by attending surgeries and community committees and sharing reports and crime prevention advice on Twitter and Facebook. Our local policing teams do a great job under difficult circumstances, however I worry that after prioritising the most serious crimes, investigation and detection of low-level crime does not seem to be important. Where I live, it is now possible to walk down the street smoking marijuana and drinking alcohol with relative impunity. It’s such a regular occurrence, that I assume it is viewed as normal behaviour by those that engage in such activities. I campaigned hard to have speed bumps and a driver feedback sign installed on my street because speeding is viewed as perfectly acceptable in my neighbourhood. Local youths think it odd when I challenge them for riding their off-road motorbikes in my nearby park, puzzled that I am trying to ruin their fun. We shouldn’t have to accept low-level crime any more than serious crime. I call on all local neighbourhood policing teams and the wider community across Salford to have a zero-tolerance attitude towards this behaviour from our fellow Salfordians. Let’s stamp it out altogether. 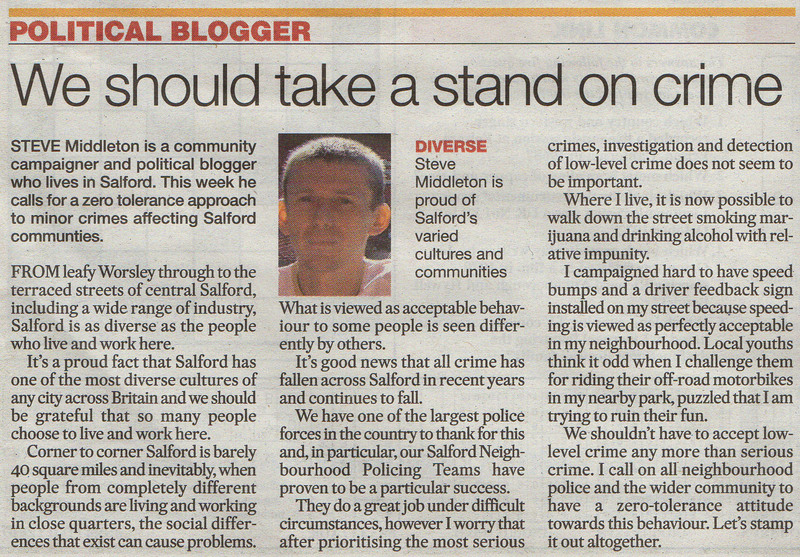 @SteveMiddleton @Salfordnews brill colum m8 totally agree .